We've made the newsletter more compact and timely! You'll now receive Georgia Wild 22 times a year instead of 12, keeping you better informed about nongame wildlife statewide. Let us know what you think about the changes (email rick.lavender@dnr.state.ga.us). You can also plug into a new, expanded array of Wildlife Resources Division updates by email and text. Click the red envelope at www.georgiawildlife.org and follow the prompts to receive state outdoors news that interests you! DNR wildlife biologists Trina Morris and Nikki Castleberry are a quarter-mile beneath untold tons of rock, smeared with mud and cold to the bone after sloshing for hours through a thigh-deep subterranean stream. Welcome to Georgia’s frontline against white-nose syndrome, where the work is sometimes miserable but ever vital. The good news? “”We haven’t found bats in Georgia that look like they’re impacted by white-nose,” Morris says. The bad: They won’t be surprised if they do. The disease that has killed an estimated 5.7 million to 6.7 million cave-dwelling bats from New England to the Midwest and into Canada, wiping out these airborne insect terminators at many hibernacula or overwintering sites, has been documented as close as Tennessee and North Carolina. 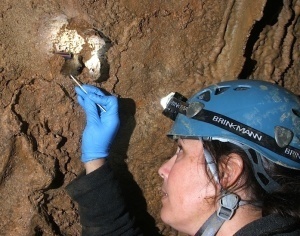 Earlier this month, Morris and Castleberry completed winter checks for white-nose’s tell-tale signs – a mold-like fuzz on the muzzle and wings, and ragged wing membranes – with a trek deep into Sitton’s Cave at Cloudland Canyon State Park. Helped by veteran caver Jerry Wallace, Morris and Castleberry counted 1,740 bats and swabbed samples from 20 for a national white-nose research project. What they found – or didn’t find – was encouraging. We Americans don’t ever seem satisfied. Take bluebird boxes. While the basic design has remained relatively unchanged for years, we are constantly seeking the perfect bluebird box. Although such a structure may be a pipe dream, wildlife biologists and other researchers are inching closer to that goal. A peek at the innovations reveals variations from slot boxes to Gilwood boxes, and from specific-sized round and oval holes (with and without shims). With the art of backyard wildlife management in its infancy, the opportunities for wildlife enthusiasts to contribute to backyard habitat management are limitless. Even when it comes to bluebird boxes. Read Terry's column … And let him know about your experiences with the different box designs (email tjwoodduck@aol.com)! Final numbers are in for the 16th annual Mid-winter Shorebird Survey, a January effort that involved about 60 people this year counting a total of 95,523 shorebirds on Georgia’s coast. Birders logged high numbers of red knots (3,402) and American oystercatchers (659), both species likely responding to good foraging conditions, and – despite long-term declines – record counts of semi-palmated (17,001) and black-bellied plovers (8,913). One low point was only 66 piping plovers, probably the result of cold weather last winter that spiked mortality rates. The survey mainly quantifies the abundance and distribution of shorebirds considered priority conservation species. It’s not too late: Young artists have until March 5 to complete and mail a drawing or painting of their favorite Georgia bird for the Youth Birding T-shirt Art Contest! Michael's gift cards for art supplies will be awarded to four age division winners and the grand-prize winner's artwork will appear on the 2012 Youth Birding Competition T-shirt! Participation is free and open to Georgia residents in preK-12th grade. Gov. Nathan Deal recently recognized three companies -- Georgia Power, Plum Creek and Wells Timberland -- as 2011 DNR Forestry for Wildlife partners. The program promotes wildlife conservation on corporate forestlands. Correction: The January issue incorrectly named the Georgia Important Bird Areas Program. 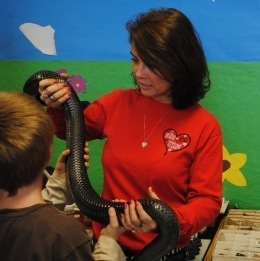 Third-grade teacher Shawna Babin, of Rocky Branch Elementary School in Oconee County, shows one of her students an eastern indigo snake. Representatives of The Environmental Resources Network and DNR recently gave Babin’s school $1,000 as the recipient of TERN’s Teaching Conservation to 3rd-Graders grant. Babin’s winning proposal will educate students about the importance of plants and healthy soils through science lab work linked to an outdoors garden her class designed last year. The check presentation featured a Charlie Elliott Wildlife Center program including the indigo snake and a bald eagle. 2012 is the second year TERN, the friends group of the Nongame Conservation Section, has provided the grant. Nongame includes wildlife not legally trapped, fished for or hunted, plus native plants and natural habitats.